You may recall the kirin ally that the chieftain mentioned and that you protected. Well, this same kirin has shied away from us since it felt the anger of its kin. Many have tried and failed to win this kirin's heart to our side once again. Now, we ask that you make an offer of peace as you are the one that protected it. If we can secure this, we might be able to gain an upper hand against the Dark Reign. Within the courtyard of Stillmoon Temple is the keeper of the cherry blossom forest. He will summon the kirin for you if you help him in his quest to find the perfect cherry blossom. You may have luck in finding this blossom upon certain goblins tending the cherry blossom grove. Your compass will direct you to the entrance. "Stillmoon courtyard gardener" is a goblin that wanders around the zone-in courtyard. It hits for a max ~750; has ~35,000 hitpoints; and is mezzable/stunnable. Kill it, and loot a "Perfect Cherry Blossom". "Stillmoon Forest Keeper" is a drake found in the west end of the courtyard. The Kirin Grandmaster is a mob named "Wong Li", who is in the small garden in the far west end of the zone. It is initially non-KOS. One laborer is a cleric; the other a pure caster. They each hit for a max ~800; have ~85,000 hitpoints; and are mezzable and stunnable. Nethran hits for a max ~950 and is a wizard. Kill Nethran, and loot an Ancient Note from its corpse. Nethran has been slain by _____! Nethran walks three steps before collapsing upon himself in a small heap. Your faction standing with Stillmoon Acolytes got worse. Your faction standing with Kessdona got worse. Your faction standing with Rikkukin got worse. Bring the note to Wong Li. The library is upstairs in the large east room (looks like a "+" sign on the map). Head downstairs and into the sand area. 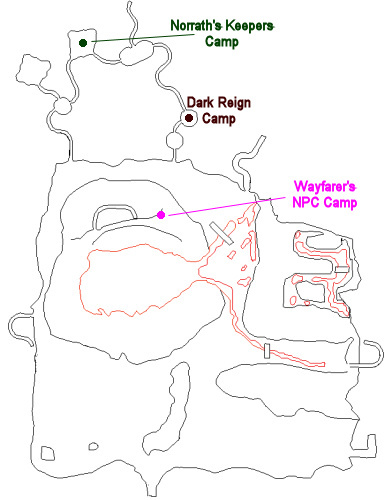 In the northeastern corner of the zone are two small rooms. In the southern of those two rooms you will find 1x "scroll thief" and 3x "scroll thief underling" (/loc 1100, -700). They can be split from one another, each hits for a max ~750 (some are rogues that can backstab for ~2,200) and is mezzable and stunnable. Kill one, and loot "Fables of Winged Harmony" from its corpse. Take this back to Wong Li, and be ready for a fight. The aggressive Wong Li is Level 75 and a druid. It hits for a max ~1,100 and has ~47,000 hitpoints. Kill it to complete your task. Surprisingly, the sly Kirin turned to betrayal. Though this journey has ended on a sour note, perhaps there are still others willing to listen to offers of peace. The librarian can be hailed from the doorway, which updates your task, but then you can't see what he has to say. This is no longer so and should be removed. Patch on 26 January 2011 prevents this now. this is what is displayed after the grand master is killed and before he says he was destined to rule. Just soloed this as a bard. Was really easy just faded a lot as I ran back and forth after kills etc to the Kirin boss and I was done in about an hour got my necro and ranja their credit for it also while sitting in guild lobby. Really easy task to solo as a bard though since a lot of it is just a few easy single mob kills and running around this is suited perfectly for a bard. I didnt even bother clearing or single pulling I just killed the few mobs I needed and looted then faded agro on all the other mobs that were on me. Same with running down the big see invis hall way of giants I just ran back and forth agroing them all and then fading upon entering garden. Kirin boss was cake , I think he was easier than any of the other mobs besides the gardener as the way I did the other mobs without clearing adds there were alot of healers healing the mobs I was killing so they took a little longer. Go Bards Go! Pretty gimply geared also if that helps you I have Fabled pet weapon and 2.0 as my DPS and 42% haste with pretty gimpy gear. About 25khp and 3kac with 850aa, so if I can do it anyone can! You can do it without killing any of the mobs in the bath house, btw. Just swim in the pool and he spawns. Confirmed. You must clear the bathhouse of all mobs. Then you must swim in either the Main pool or all of them to spawn him. Nethran almost instantly spawned when doing so. loc of the portal entrance. If you run into problems spawning Nethran have the entire group zone out and all zone back in....then run back to the bathhouse area--we killed for over 1hr trying to get him to spawn and cleared everything...he only spawned when we zoned out and back in...think the trigger was messed up and zoning out and back in some how reset it. I just did this task and i didn't need to kill anything in the bath house area to spawn Nethran. I swam to the pool in the middle of the bathhouse area and swam around it a bit and saw nethran up alone. I pulled him and got one of the laborers but not the other. If i had done it quicker im sure i could have singled him. edit1: nethran didn't spawn. i take back what i said about relife. edit2: ok we got nethran to spawn. our dirty monk swam in the pool in the middle of the bath area and they spawned. i don't know if that was the trigger or not, but no one else was doing anything significant when it happened. Did this mission with 3 warriors, an enchanter, a beastlord, and a druid. All 70th level. Time, Ikkinz, OoW raid geared. Took about 2 hours total with one recovery in the middle. Take your time and pull 2 or 3 when necessary. Do try to have FD/bard puller or CC with you, as the mobs frequently come 2 or 3 at a time. Wong Li was a big overcon for us, as he spent his short life trying, to no avail, to cast spells at us. 2. Loot Perfect Cherry Blossom. 3. Give Blossom to Forest Keeper. 8. Give Note to Wong Li. 12. Give Harmony to Wong Li. Every Iron Worker see's invis, take your time killing roamers so they dont add. The map labels realy helped, thanks Legolaas; Although, the scroll theif was located in the room below were the label had him. Was able to root the adds and take out the scroll theif no problem. Just re-rooted and was fine. We had no repops in our mission, so we were able to take our time. When I went into Western Garden, Wong Li was a scowling red kirin, so I stayed very far away. Will he attack me if I get too close? Also, does the flagging for this work like Gimblax Mission, where even if you are not at that point in the progression you still get the flag for it? Also, I believe a necro might be able to solo this entire mission. Or maybe might need enchanter help for crowd control. I soloed the first mob easy... all of the courtyard mobs were easy as well. If you can pull 2 mobs at a time maximum and keep 1 rooted while other dies, then I suppose a necro could solo the whole thing. However, I only got to the part with Nethren before I got booted from the zone due to people leaving the task. I will have to try this again later. .. also need to kill the gobbies in the rooms around the fountian. My question is: Does the whole group get credit or just the person who got the mission? I am pretty sure that it flags the whole group, b/c I got credit without having been the one to start the mission, but I want to be sure. I wouldn't want to drag 4 other people through to flag my alt if that wasn't the case. I did this with 3 others that needed the credit and we all got the flag so i would have to say yes everyone that needs it gets credit for it. He casts Elnerick's Entombment of Ice, Invert Gravity, Shock of Magic, Draught of Ice, Telaka. We got to the ancient note from Nethran part but the group member who looted the note was not able to get Wong Li to accept it so we had to leave. Is this a bug or is there person working on progression suppose to loot? Scroll thief is way over on the east side, about as far as you can get from Wong Li's room. Scroll thief is at 1100 -700 or so in the southern of the 2 rooms off the east side. He is impossible to single pull without good fd or calming the room. If you are in the doorway to the bathouse, having just walked off the wooden walkway there is a trigger nearby. If you are facing the pool walk through it and just on the opposite side is a "trap" that will spawn the guy. I would clear the rooms out so that you only get him and his two adds. His adds come from the north room and him from the south. He comes a bit slower you should have at least one add dead before he engages. Anyway after clearing the rooms walk straight from that walkway over the pool and strafe left to right until you hit it. Way easier than clearing the next dozen mobs or so. After doing this mission a bard works even better then a rouge. no Undead so stable bard invis works wonders and if something should go funky he can FM. Plus he can track his target. 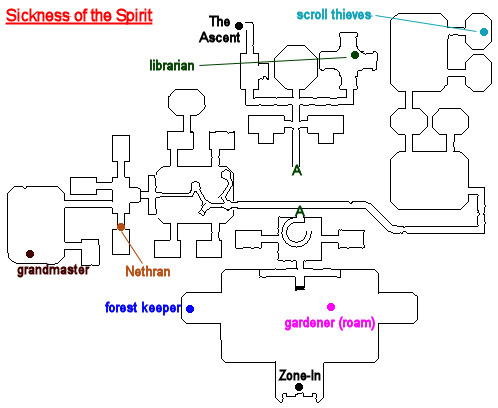 First off, I have confirmed that you must clear the bath house entirely of mobs to kill Nethran. Secondly, when Nethran spawns, 2 goblins spawn with him to guard him, so be prepared for that. Thirdly, Wong Li is an extremely easy fight, I remember him being easier than any of the other mobs. I don't believe he rampaged/flurried or enraged, but I can't confirm that, all I remember is that he is extremely easy. As a monk I did the hail of Wong Li while the others in the group where near Nethran's spawn point. He didn't show right away but did pop all of a sudden shortly after I got back to the group. Conditions were too confused to be sure but it seemed like either the majority/all had to be in his room or he's slightly delayed(2-3 minutes). Two goblin's also popped out in the bath area near walkway garden. This mission takes a long time to complete compared to other missions. Mobs don't respawn in this one, but you have to kill most of the mobs in the zone as it requires you to go all over the zone for turn-ins and named kills. Mare sure you set aside a couple hours for this at least, unless you have some serious DPS. This past weekend I did this even 3 times. This event now awards 48 crystals. The first time we did the event it took 3 hours. We were getting ready to tank the mission because we did not realize we had to hail Wong Li in the beginning. Once we got past that, the rest went quickly. Second attempt we got the event down to 2 hours and then 1h35m on the 3rd stab and that is assignment to completion. Group configuration: 70 Warrior, 70 Cleric, 70 Mage, 70 Necro, 70 Chanter (botted by Warrior) and 69 Shammy (botted by Necro). Nethran -- Nethran along with the two adds come one from each of the 3 rooms. We figured that one out on the 2nd attempt. On the 3rd attempt when we were ready for him, we headed to back corner of the room on the West (single room). We sat there. Warrior ran out did the trigger for him and then ran around in the hallway looking for him. He ran through the round pond and this seemed to of triggered Nethran. We took him out in his room (no adds). We then pulled the other two and finished them off. As for Wong Li, we ran to him and got close. Make sure you clear out all the mobs around him first. This includes the 2 iron guys standing guard. If you are on the north side of the tree you cannot target him. We waited for him to come down the bridge to the grass. If you con him it says he will attack but he will not. We took our positions around him, Warrior did the hail and then we let loose on him. Easy kill. Warrior had a HoT on him just before the hail and I don't even think I saw his HP's drop (10.5k buffed). On our first attempt the warrior said Wong Li did not even touch him, it was probably to busy trying to cast. A rogue in group can cut out a lot of time for some of the hand ins.